Sarah Palin is still on the minds of a lot of American’s; usually the losing ticket sort of fades away into obscurity, but not if you’re one Sarah Heath Palin who just happened to model in a bikini back in 1984 in a beauty pageant. Read more, see photos and bikini video below. Bikini or not, Sarah Palin is still a favorite of conservatives, and still a favorite target of the left. Like I stated earlier, how many of you thought Lloyd Benson was a viable threat after he and Dukakis were defeated back in ’88? How many conservative hit pieces were there on Geraldine Ferraro after the 1984 election? Not many if any at all. For some reason though, the left wing media and the democratic party are still gunning for Sarah Palin. Conservatives disagree on whether or not she is the right person to lead the Republicans back from the wilderness; my guess is if she puts on that bikini again, she would have more than just conservatives following her anywhere. The very reason that this bikini, beauty pageant video is still making the rounds like it is, is the fact that the left wing media is still trying to discredit Sarah Palin. The only possible reason is that they saw just what a potential danger she is to their current stranglehold on power. Sarah Palin is a natural leader, whether she’s wearing a skirt, bikini, or blue jeans she has a natural ability to lead people. Unfortunately for Sarah Palin, many Americans today still put a lot of stock into what the media has to say. The media should have lost credibility on the subject of Sarah Palin after they went after her daughter, publically ridiculing and making a mockery of her failed relationship. If the truth were known, the media probably has a bit of blame in that as well. How many teenage kids could put up with that kind of scrutiny and pressure? Readers here at Right Pundits are free to make their own choices; make their own decisions. 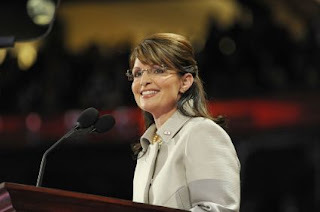 Do you like Sarah Palin? Do you respect her? Does the fact that she competed in a beauty pageant 24 years ago and you can see a woman who is governor of a state and was very close to being Vice-President in her bikini make her have less credibility with you? Before you answer the last question; think about your life now, then think about it 24 years ago. How much of what you did 24 years ago do you want the world to know? Bikini video not withstanding.